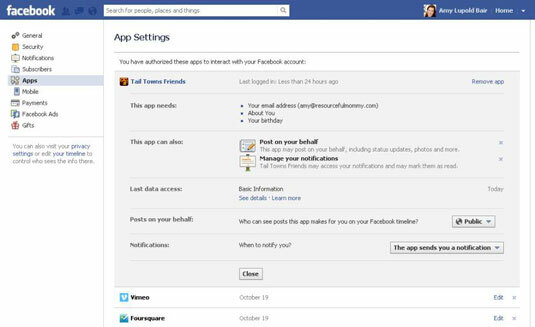 Should You Allow Facebook Applications to Access Your Child’s Information? Consider the effect that the use of Facebook applications will have on the privacy of your child’s account information. Apps include popular games (such as FarmVille) as well as popular quiz-taking and cause-sharing apps, for example. The use of applications is a favorite feature of many Facebook users, including teens, but will affect who has access to the information on your child’s Facebook account. Also stipulate in your family’s policy whether children need to request parental permission for each individual app before granting that application access to the account. 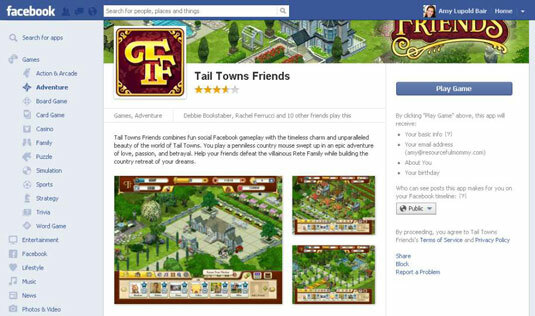 Applications are used by Facebook account holders for anything from gaming to reading the news via your Profile page. When you install an app, you’re granting it permission to access your public information. This request for information may include such information as your name, profile picture, e-mail address, and birthday. You may also be allowing the application access to additional information so that it may post updates on your behalf and allow other users of the app to see your notifications. The additional information requested generally appears during the application’s install. Account holders may choose to remove permission for an application to access their account information even after they have granted the app permission. If you’re helping your teen update their account settings to create a more private account, you may want to encourage them to change these permission settings. To restrict an application from accessing your information after you chose to allow access, click the Edit Account drop-down arrow in the upper-right corner of any Facebook page and choose Account Settings. Then click Apps in the left sidebar to visit the App Settings page, where you can edit an application’s settings or delete an application. You may wish to change some permission settings as a matter of convenience. Many Facebook users simply don’t want to receive frequent notifications from the apps that they use. Other permission settings are a matter of privacy, such as having access to your e-mail address and Friends list. When covering Facebook rules, discuss whether you will have access to your children’s Facebook accounts. At the very least, require your teens to “Friend” your Facebook account. You may also require your children to provide you with their Facebook username and password in order to monitor their activity and protect their safety. The actions that teens take on Facebook today will affect them for years into the future (including college admission and employment) because of their digital footprints. Click the gear menu next to the item you wish to report to Facebook. If your child is under age 13 and has created a Facebook account, you can report this by filling out this form. If Facebook can verify that the child is younger than 13, Facebook will delete the account. You or your child can choose to delete your Facebook account.